Brooksville, Fla.-November 15, 2018. AME International, a leading provider of tire service tools and equipment based out of Florida, introduces two new tools for seized wheels, the RimWit and RimWit Junior. Designed to remove locked rims on commercial truck tires, the RimWit is the newest solution to loosening stubborn truck wheels and rims without fear of damaging tire sidewalls or rims. Manufactured to fit all standard semi-truck rims, both aluminum or steel, the RimWit is designed to be a portable, efficient solution for the tire demounting process. When faced with a stuck wheel or rim, tire technicians typically resort to heavy sledge hammers, potentially causing damage to the tire and rim components. 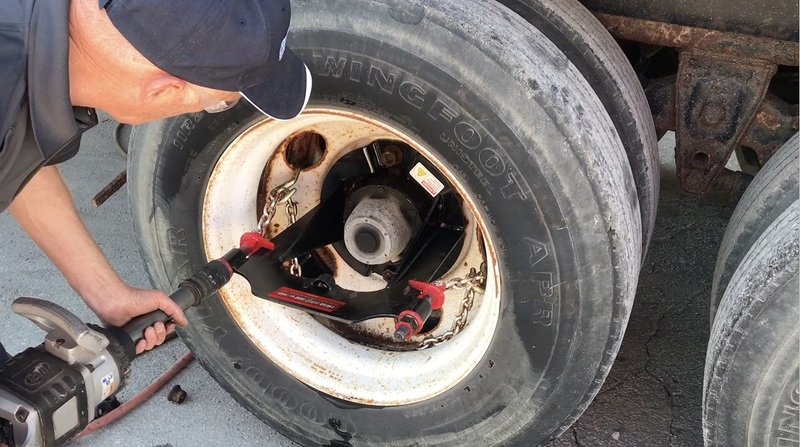 The RimWit’s patented wheel pulling technology is an affordable and time-saving solution for any mobile or fleet tire service shop. Ideal for use in a shop or in the field, the RimWit functions with the application of an electric or air impact wrench. Available in a junior size to accommodate 19.5 truck tires, the RimWit-seized wheel solution is the easiest remedy to remove locked rims on all truck tire sizes. To request additional information about AME International and the RimWit, email sales@ameintl.net, call (352) 799-1111 or visit www.ameintl.net. AME International, a Brooksville, Florida based company, offers a broad range of tire changing tools and accessories including: bead breaking hydraulic rams, tire branders and spreaders, tire changer and balancer accessories, airbag lifting jacks, and tire truck accessories. The company designs and develops tire tools and accessories using the latest technology and employs expert and highly skilled professionals to ensure that only the best products and services are delivered to their customers. AME International now offers, accurate battery-powered torque, specific for OTR and Commercial trucking application. Don't risk over or under torque! Call us today for more information and pricing @ 352-799-1111. The TorqIT torque guns are ideal in tire service applications on equipment and vehicles in the commercial and OTR industries. Calibratable, battery-powered torque up to 3,000 ft/lbs! Call 352-799-1111 for pricing and ask about how to qualify for a RISK-FREE trial. Torque your lug nuts right the first time, EVERYTIME! AME International is heading to Munich, Germany for the 2019 Bauma Trade Fair! Bauma hosts one of the largest exhibitions of all of the latest innovations and technology within the evolving mining and construction industries. Heading to Germany? Be sure to stop by and visit the AME team at booth # C4.627. The Mid-America Trucking Show is underway and AME International is looking forward to seeing you @ the Kentucky Exposition Center in Louisville, Kentucky! Be sure to stop by and visit our booth #67101 in the West Wing for show specials and live demos! Update: Phones are back up and running! We apologize for the inconvenience. Original Post: ⚠ We are currently experiencing technical difficulties receiving calls from AT&T provider phone networks. Should you encounter issues, please call our toll-free number @ 877-755-4263.